15th century tile from Vilnius Lower Castle. Designation & Expulsion (2018) uses the text of pagan Lithuanian charms from the book Lithuanian Verbal Healing Charms (2008) compiled by Daiva Vaitkevičienė. The author apply a classification of charms, two of them being Designation and Expulsion. Composition explores a relationship between the sounding of a word and its emotional impact of meaning. The stretching of words is used until the loss of their concept and the gain of a different effect is achieved exploring the sounding of Lithuanian diphthongs. Harmonically percussion and voices are interlinked and only few intervals dominate the composition while the rich Lithuanian consonants are orchestrated with the non pitched percussion. Composition draws inspiration from repetitive and austere manner of saying charm formulas. 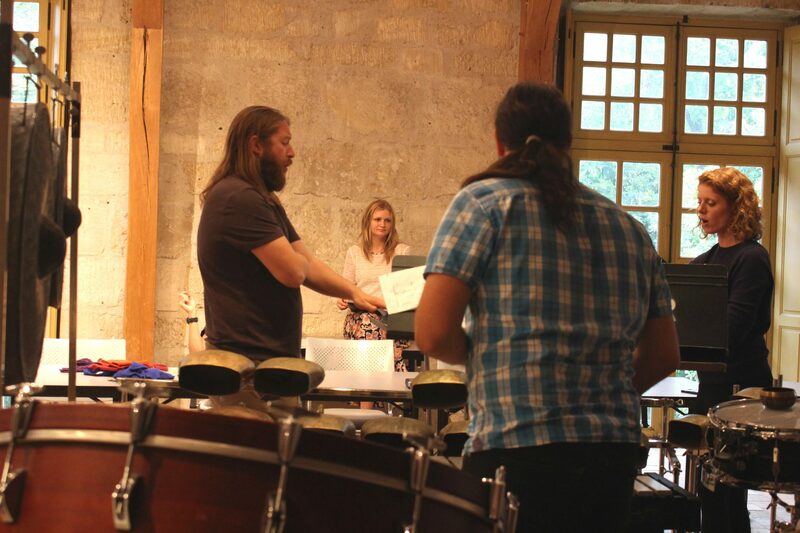 Rehearsal at Royaumont. Photo by Aliette de Laleu.